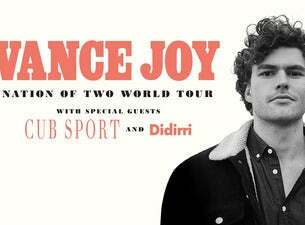 Less than two weeks until the release of his hotly-anticipated sophomore album, Nation of Two (released on Friday 23 February via Liberation Records), and alongside the announcement of a colossal run of international tour dates, Frontier Touring is pleased to reveal Vance Joy will be heading out on a national tour this September. Nation of Two, the follow up to his critically-acclaimed debut dream your life away, will be released via Liberation Records in Australia and New Zealand, and Atlantic Records throughout the rest of the world. Fans who pre-order Nation of Two will receive ‘Lay It On Me’, ‘Like Gold’, ‘We’re Going Home’, ‘Saturday Sun’ and ‘Call If You Need Me’.